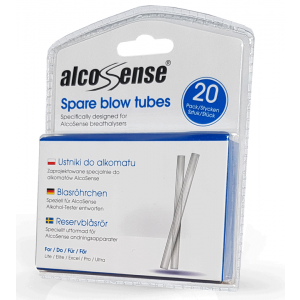 AlcoSense Blow Tubes are nessesary for the AlcoSense Lite, Elite, SE and Zero, but also fit the AlcoSense Excel, Pro and Ultra (for ultimate accuracy we recommend using the AlcoSense Professional Mouthpieces with the Excel, Pro and Ultra). Or you could just buy some drinking straws and cut them to size. I bought these to complement an Alcosense Breathalyser. The tubes are sturdy enough so that you can fit them to the machine and blow into them without them bending. Spare tubes are always handy especially if you have had a party and everyone is trying to see how drunk they get as the night go’s on.Then it’s the serious reason for its purchase the next morning for people using it to gauge when they should be looking to go home. Very good, not sure how accurate it is, but gave me and my ex partner a good idea if they were safe to drive, in Australia and the UK. Liked the product so much ... simple and easy to use ... that we’ve bought another as a Christmas present... so important for the morning after check!! Essential accessory really. Does the job. As expected and prompt service. Bought for work, but not needed to use them yet. They fit the device perfectly. Which I suppose is unsurprising, as they come from the same manufacturer. All as expected and described - no negative issues at all! Very pleased with the alcosense elite breathalyser it does exactly what I wanted it to do. Great product and great service. I bought these for my AlcoSense Elite Breathalyzer & alcohol tester. I originally bought this from another shop but have found it to be reliable and easy to use. It is always better to be prepared and have yet to find a downside to this product. They are very good if you decide to have a drink then you can use the Alcosense in the morning to check that you are not over the limit also checking at all times when having a drink. I have tried these a few times once I was over, I did not drive the rest I was absolutely fine according to the test. My friends comes up and ask to use it as well, always changing the tubes for hygiene reasons and getting the correct readings. The product was delivered promptly and works as expected. No problem with this product or seller. Works as advertised. I think they're a bit expensive, maybe cut down on the plastic packaging? Good quality items for a top product. Handy (and necessary) addition to the AlcoSense Lite Breathalyzer and alcohol tester if the tester is to be used regularly. Although it comes with 5 straws, you will need these to go with the elite breathalyser - which I highly recommend! I was very hsppy that my order arrived a day earlier than expected. 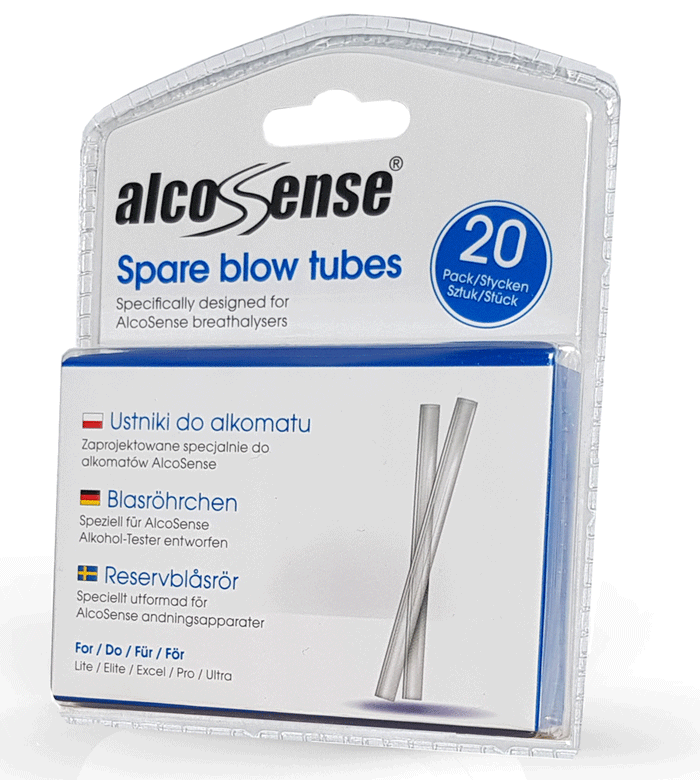 You receive 5 blow tubes with your Alcosense however knowing you can easily get more as required is great. The Alcosense Lite (my model) is easy to use and has stopped me driving the morning after. It may be a bit more expensive however worth every penny. Fits, so not a lot to say about the tubes.Fit and work well. Received quickly & as described. I needed some more tubes for my breathalyser and it was easy to find what I wanted. DNew Tubes to CAtch Your Breathelivery was OK but I might question them on the price, though, after all they are just thin walled plastic tubes. What can you say. These are plastic tubes which attach to the AlcoSense meter. They fit the machine! sufficient supply for the needs of my family and I. Further replacements easy to obtain when required.The Alcolyser is of excellent quality easy to use and provides an accurate result. Highly recommended. This was received the very next day after I purchased this as promised and therefore shows a very good and reliable service. Simple necessary product, good if a little pricey. You could probably do the samed job with cut down large drinking straws. But these are easily available, and fit the machine properly. I was never able to use these because I could not make the Alcosense Elite breathalyser work at all, so no opinion. Excellent no more over the limit driving the next day better safe than sorry you never know when that police car will be waiting in the car park!